Each Surround is made from the finest marble available and is hand polished to provide a truly premium finish. Utilizing unique facing panels which "pocket" behind the jam and frieze, each has the ability to fit most fireplaces. 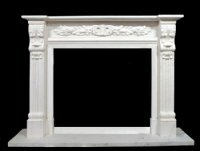 A special bottom "filler" is also included standard on all hand carved english marble surrounds, enabling coverage of the suface on a raised firebox. All Marble Surrounds Must be shipped by Freight Truck! Due to the weight and fragile nature of marble, delivery must be via truck with a lift gate or a truck height dock only (minimum 4 ft high)! Please carefully inspect container and product upon receipt.